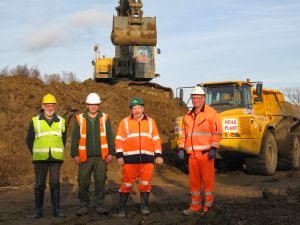 Huntingdonshire District Council Countryside Services' plan for an Environmental Education facility at Paxton Pits Nature Reserve has taken a major step forward thanks to the generosity of neighbouring Bardon Aggregates Little Paxton Quarry. The company has cleared away a mountain of earth that was blocking progress on the development, and also excavated a special pond to provide safe pond-dipping facilities for the visiting schools and the Reserve's own children's wildlife group. The earth had been stockpiled on the site after excavation from the Reserve's Great Meadow wetland restoration project. The spoil, which needed to be removed from the River Great Ouse flood plain did not go to waste, and was used for restoration purposes within the quarry. "The Friends is pleased to have played a key role in arranging for this outstanding gift from Bardon Aggregates to the Reserve. Some 8,000 cubic metres of earth have been shifted to clear the site and create the pond. We are also indebted to Lafarge Aggregates, Oxford University Chest and Cambridgeshire County Council's Mineral and Waste Group for their crucial cooperation in the complex arrangements." "The Company is delighted to support this important development. It's obviously not an easy project for us to undertake in the currrent economic climate, but we felt that this timely and appropriate chance to invest in the future of local children could not be passed up." "We are so relieved to see the back of what had become known as 'Mount Jim', and the new pond within the Education Area will enable us to provide the children with their favourite wildlife activity without a long trek to one of the Reserve's lakes. We can now plan classroom facilities and a range of sample wildlife habitats within the Area."